Here at SummerCádiz we welcome you to visit the charming city of Cádiz, roam its beautiful streets full of history, and try its legendary gastronomy. We are centrally located in the historical district, and just a 3 minute walk from a number of key attractions including Cádiz’s most iconic beach “La Caleta”, the renowned theatre “Teatro Falla,” easy access to the city’s public bus routes, and numerous other points of interest. Furthermore, we offer tourism information and free maps so that you’ll never get lost! 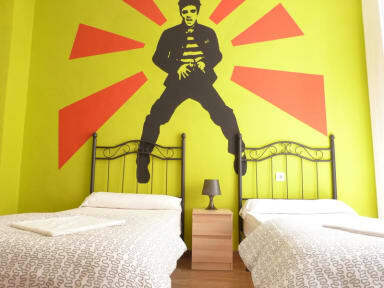 In our hostel you’ll find a relaxing environment with all the commodities that you’d want after days of travelling. We’ve made available a spacious, fully-equipped kitchen, a living/dining room with a TV and computer, complete with free WiFI. There’s also a rooftop terrace which makes for a great place to meet other travellers, relax under Cádiz’s sunny skies. But not everything will be peace and quiet. For your enjoyment we have free walking tours, pub crawls, and afternoon snacks at sunset. We also organise surf classes, dinners with flamenco shows, and many other activities! We allow our guests to check-out as late as 12:00 noon. Our reception area opens at 9:00 in the mornings and we even allow check-ins after 01:00 at night as long as you let us know via e-mail.